4.2 out of 5 based on 32 bloggers and 3 commenters. 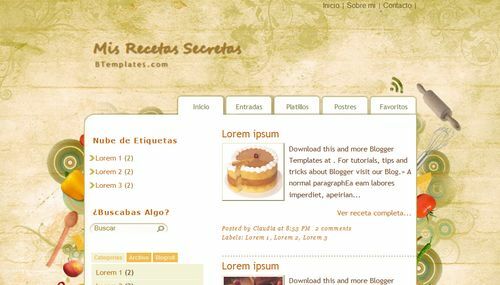 Mis Recetas Secretas is a free blogger template with 2 columns, left sidebar, rounded corners, an exclusive design for Blogger, posts thumbnails and vintage style. Não estou conseguindo fazer o Download com o HTML, o que eu faço??? I am using this template currently. I am having some difficulties regarding title of pages which are is spanish.I am unable to change it. any help. Over all i like it :) gr8 work.